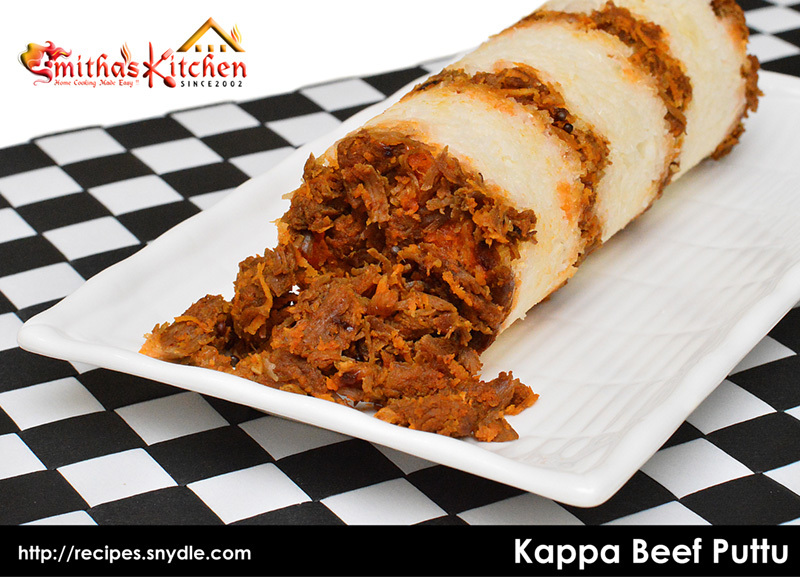 A special recipe of Kappa Beef Puttu made using fresh Tapioca and boneless Beef. Clean and drain the beef pieces. Heat 1 tbsp oil in a pressure cooker and sauté whole garam masala. Add ginger, garlic, onion, green chilli, tomato and sauté well till onion turns translucent. 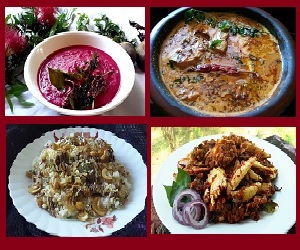 Add beef pieces, ¼ tsp turmeric powder, red chilly powder, meat masala powder, garam masala powder, fennel powder, salt and combine well. Add ½ cup water, stir well and close and pressure cook on medium to high flame for 4 to 5 whistles and switch off the flame. When the pressure fully released, open the cooker and check the consistency. If it’s too watery, continue cooking on high flame with lid open and bring it to thick consistency similar to beef roast and remove from the heat. Take out the beef pieces from the thick gravy and coarsely shred them using a food processor or an electric blender and put it back to the thick gravy and mix well. Heat 1 tbsp oil in a wide mouthed vessel and splutter mustard seeds. Add few curry leaves and sauté well few for seconds. Add the shredded beef with gravy, grated coconut and saute well on high flame until all the moisture gets evaporated and the masala gets coated on beef chunks. Peel the tapioca and wash in water. Grate the cleaned tapioca using a vegetable grater and wash the grated tapioca in normal water using a big strainer and squeeze out the water completely with your hand. Repeat this process two or three times so that the maximum starch will drain out from the grated tapioca. Add salt to it and keep aside for 10 minutes. Spread the squeezed tapioca on an absorbent paper or on muslin cloth for few minutes and make sure the moisture has been absorbed completely. Transfer the tapioca into a mixing bowl and add rice flour to it and gently mix it well. Adding the rice flour will helps to absorb the excess moister left out in the grate grated tapioca. In a Puttu maker add 1 tbsp cooked beef and the grated tapioca till half. Repeat the process and fill the puttu maker. Close the lid and steam for about 8 to 10 minutes. Serve hot and enjoy your Kappa Beef Puttu.